It's dumb, it's cute, it's easy to market expensively marketed. Okay, granted, I have a two-week-old at home, so I haven't been sleeping well. And granted, I wasn't really into the Despicable Me movies and didn't look forward to yellow Ewoks trying to carry their own movie. But still, I nodded off at least five times in this movie, once for probably a significant amount of time (between Overkill sending the M's to overthrow the Queen and the M's abdicating (?) in favor of Overkill). Hard pass. Take the kids and hang out in the lobby. We loved it. It didn't pretend to be anything it wasn't. Light and silly and made of fluff. We laughed our heads off. It's more like a long Monkees episode than anything else -- plotted for goofiness, and nothing else. But I was in the right mood, and John Hamm's voice work is great. Dumb fun, more well-executed than not (although the balance is probably about 60/40) and I feel like it delivered better on the Despicable Me premise better than either movie with that actual title did, just by virtue of having the supervillains foiled by stupidity rather than do-goodery so the plot could stay on things like lava-powered rocket dresses and ridiculous crown heists. Plus Bullock and Hamm were clearly enjoying themselves in the voice studio. I thought it was about on par with the other two Despicable Me movies. Not as horrible as sooooo many animated movies, but nothing really special either. It proved to me that the Minions are best used as they were in the other two: as occasional comic relief. I thought the bits with the other left-behind Minions trying to get to London were funnier than the main action, so even in their own movie they were better as the comic relief. But a movie like this isn't trying to be good, just profitable. They managed so many product tie-ins that they would have turned sufficient profit just from the merchandising. 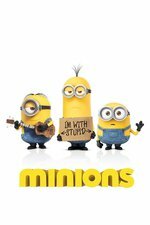 Get ready for Minions 2 in time for Christmas 2017. Nope, briank, the next movie is DM3 (Despicable Three? Iunno). 2017 is right though! Giggled like maniacs. The only thing I didn't like about the execution was too many recognizably English words coming out of their mouths--unavoidable, I guess, in what is ostensibly a kids' movie. Other than that? Pure fluffy silliness from start to finish. Which is exactly what they promised, so win-win really. I was slightly disappointed in this. It's pretty well made, and some of the animation was well done, but it just wasn't as funny as I was hoping it to be. I wasn't really bored with it, but I rarely laughed either. I haven't seen either of the Despicable Me movies, so maybe my expectations were too high? The idea that taking the comic relief from those movies and extending that to a full feature waters it down is probably true. I went in with the expectation that it would be cute and mildly funny, and it was! The tiny bit of Malay (terima kasih) helped endear me too. I still hate the whole premise which boils down to "we threw in these cute yellow creatures into another movie for comic relief and merchandising ops, they became wildly popular so lets create some sort of backstory for them so we have an excuse to make a whole feature and MOAR MERCHANDISING". And the whole minons live to serve the most evil boss they can find and not kill through their own incompetence thing is just ridiculous. Seriously, how is Gru still alive? Gru's incompetence and that of the Minions cancels each other out. The thing about the Minions is that what they're good at is last-minute/emergency stuff. I took the boys to see it on a wet rainy day this past weekend. It was alright; the first half is chock-full of gags that had both boys (and me) giggling. And then it kind of bogs down in the whole Scarlet plotting thing, to the point where my 9 year old got a little bored and was wondering when it would be over. My six year old enjoyed it all. I think, after this, that I prefer the Despicable Me movies - they at least had a plotline that felt like it involved the characters. Whereas the Minions just kind of bumble along and achieve or foil things through incompetence or happenstance - which can be fun, but isn't a basis for interesting storytelling in the long run. It's a mix of English, Spanish, Italian, and I think some French - which, combined, makes them more intelligible than I recall them being in either DM movie. It is a little unfortunate, but I also think that because they had to carry the movie, it had to happen. The animation, especially during the London chase, was really on point. I ended up double checking thinking they had used photo background or something.